This subsection consists of steep mountains and broad valleys west of the northwest trending Little San Bernardino Mountains. 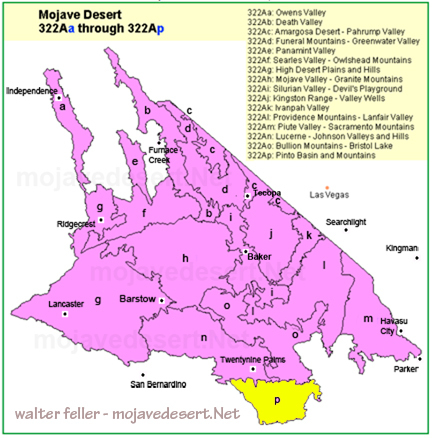 It includes the Pinto Basin, Pleasant Valley, and the Pinto, Coxcomb, Eagle, Hexie, and Cottonwood Mountains. It has a hot to very hot, arid climate. MLRA 30g. Lithology and Stratigraphy. The bedrock in this subsection is mainly Mesozoic granitic, Pre-Cretaceous metasedimentary, and Precambrian metamorphic rocks. Alluvium and basin-fill predominate in the valleys; lacustrine deposits are not extensive. Geomorphology. This subsection is on steep mountains, moderately steep hills; very gently to moderately sloping pediments and alluvial fans; and nearly level basin floor. Dry lake bed and dune sand are not extensive. 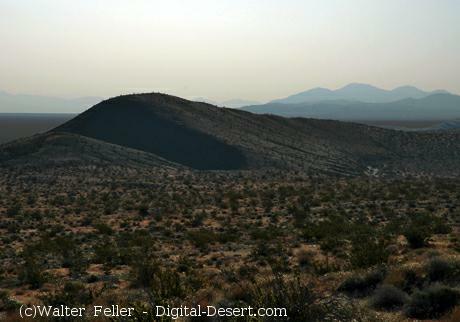 The general orientation of the hills is not clear, except the north-south aligned Coxcomb Mountains on the eastern edge of the subsection and the Pinto Mountains which are along the east-west Pinto Mountain Fault that is the northern boundary of the subsection. The Pinto basin and southern edge of the subsection along Shaver Valley are aligned east-west. The elevation range is from about 1000 feet up to 5350 feet in the Eagle Mountains, 4834 feet on Monument Mountain, and 5687 feet on Queen Mountain. Mass wasting and fluvial erosion and deposition are the main geomorphic processes. Soils. The soils are mostly Lithic Torriorthents and Lithic Camborthids on uplands. Soils on younger fans and basin-fill are mostly Typic Torrifluvents, Typic Torripsamments, and Typic Torriorthents. The soils on older fans are mostly Typic Calciorthids and Typic Haplargids. Soil temperature regimes are mostly thermic on mountains and hyperthermic in valleys. Soil moisture regimes are aridic. Vegetation. 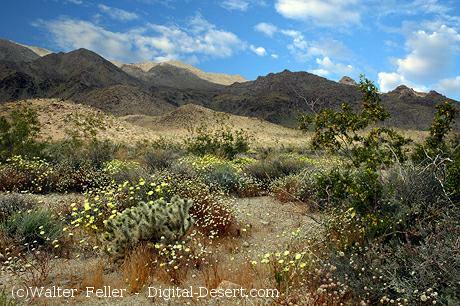 The predominant natural plant communities are Creosote bush series and Creosote bush - white bursage series. California juniper series is common on higher mountains and Joshua tree series is common on pediments and fans. Fan palm series occurs in riparian areas near the southern edge of the subsection. Grasslands: Big galleta series, Desert needlegrass series, Indian ricegrass series. Shrublands: Birchleaf mountain-mahogany - California buckwheat series, Brittlebush series, California buckwheat series, Creosote bush series, Creosote bush - white bursage series, Desert-holly series, Joshua tree series, Mojave yucca series, Nolina series, Rubber rabbitbrush series, Teddybear cholla series, White bursage series. Climate. The mean annual precipitation is about 4 to 8 inches. It is practically all rain. Mean annual temperature is about 50� to 72� F. The mean freeze-free period is about 200 to 300 days. Surface Water. Runoff is rapid from mountains and alluvial fans and slow from basin-fill. Runoff from Pinto Basin and most of the mountains is to Chuckawalla Valley. Streams are dry most of each year. There is temporary ponding on playas, or dry lake beds.